State and local compliance officers may look the other way when it comes to violations of the Clean Water Act. Officers are often stuck between a rock and a hard place. If they do their job, the legislators who fund them often threaten to slash agency funding. Unfortunately state and local compliance officers too often give bad compliance advice. Too often they okay wastewater discharge practices that are in clear violation of the Clean Water Act. Congress anticipated that lax enforcement would occur in some locales. The U.S. Congress added a provision into the Clean Water Act. They added a citizen lawsuit provision (33 U.S.C. 1365) that allows people to enforce its provisions if neither the state nor federal governments are doing so. Environmental Watchdog groups are winning lawsuits that are filed directly against polluting facilities. Some of these fines have been very high. Affected facility owners have been very upset to discover that advice they followed from their state and local compliance officers were wrong! A 2007 North Carolina Division of Water Quality study found that typical boat-wash wastewater contains 69,000 times more copper than the Federal Clean Water Act allows for discharge. Ever notice how many media features focus on companies that adopt new “green and clean” practices that positively impact the environment? If a marina grabs a vanguard position in environmental compliance; their initiatives will likely be publicized in local, state and possibly the national press. Consumers are increasingly Green Conscious. Have you noticed how much of automobile marketing is now focused on the “greenness” of their new models? Market research reveals that the environmental friendliness of products and services play key roles in purchase decisions. Does Non-Compliance put your marina on thin ice? – Imagine a competitor a few miles away has taken the plunge and invested the necessary capital to bring their power-washing into compliance. Imagine that you want to attract more customers by offering lower haul-out and power-wash services. What is the possibility that the compliant owner will call to complain to compliance officers and/or the media about unfair trade practices? The compliant owner will be able to make a very good case that your non-compliant marina is unfairly under-cutting their rates. How will compliance officers react to the Clean Marina’s complaint? How would the media respond? Should you risk the negative publicity that may follow? The advantages of Going Clean and Green now are great. 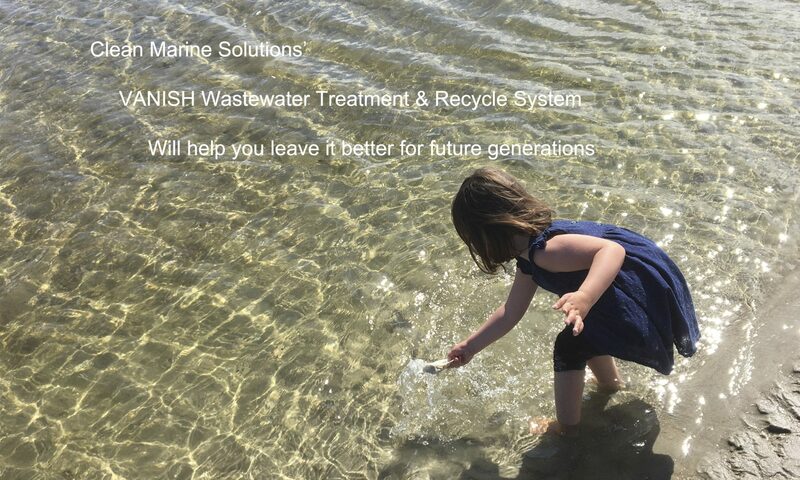 Clean Marine Solutions stands ready to solve your power-wash compliance needs with our affordable and easy to use VANISH 300 Marina Wastewater Treatment and Recycle System. Many businesses, from small dry-cleaning operations to massive coal plants have operated in a fashion that releases harmful chemicals and compounds onto our land, and into our air and water. Boatyard and marina operators, often unknowingly, have contributed to the environmental degradation of our water quality and marine life. Boats are painted with biocides commonly known as anti-fouling paints. For decades, boat yards and marinas have pressure washed boat bottoms to remove marine growth and to remove old anti-fouling paint as part of routine boat maintenance. Anti-fouling paints contain heavy metals. These heavy metals have a serious negative impact on marine life. Oysters, clams, and algae bio-accumulate copper to their own demise. Reproduction and thus harvesting yields are negatively impacted. The impact increases exponentially as the heavy metals work their way up the food chain. For decades boatyards have been allowing heavy metal-laden wastewater generated from pressure washing to flow into coastal waters, rivers, lakes, estuaries and adjacent property. A Sea Grant officer stated at the January 2007 Clean Marina Association Meeting that there were no boatyards or marinas in compliance with the Federal Clean Water Act. Clean Marine Solutions (CMS), has built an affordable wastewater treatment system that offers a unique and cost-effective way for boatyards to achieve environmental compliance. The main components of the system are a water clarifier and an evaporator. Tests reveal that the Vanish 300’s water clarifier removes 99.5% of copper in the wastewater. The clarified water is then recycled or evaporated. A 50-gallon drum of heavy metal-laden wastewater can be reduced to a half a pound of dry precipitate that can easily be permitted to be properly contained in a municipal landfill. The CMS system costs thousands less than the competition and is over 80% less expensive to operate. The federal Clean Water Act sets forth standards for wastewater discharges. The Environmental Protection Agency (EPA) charges individual states with enforcing the law, which varies widely from state to state. Overall, compliance standards are becoming tougher, and many states are more stringently enforcing environmental laws. States that currently don’t have rigorous wastewater standards can expect to see them in the coming years. Even if the government isn’t currently forcing marinas in certain areas to meet stricter standards, they can still prepare now for the future. And making powerwash operations more green have other benefits to help marina business. The Clean Water Act regulates many contaminants. A 2007 study by the North Carolina Division of Water Quality found that typical boat wash wastewater contains 69,000 times more copper than the Federal Clean Water Act allows for discharge. In particular, environmental compliance authorities have growing concern that some wastewater recycling systems do not remove heavy-metal concentrations to environmentally safe levels. These agencies have observed that a significant quantity of high-pressure powerwash wastewater drifts onto surrounding property and waterways. Does the marina have a recycling system that is designed to remove heavy metals to the extent necessary for easy compliance? What would the facility estimate the additional labor costs would be if staff had to secure a spray barrier around each boat hauled? If current state standards aren’t in place, how long will it be before the state’s compliance officers issue similar standards?A marina or boatyard shopping for a powerwash recycle system should make sure the system has been designed and manufactured in anticipation of the toughest compliance standards and can be easily permitted by compliance authorities. In addition to keeping marinas in compliance with environmental regulations, installing an effective recycling system can also bring additional benefits to the business. Consider the following reasons why marinas should make sure they comply with the strictest wastewater standards. Most lending institutions require environmental audits for boatyard and marina financing. Just like a termite inspection on a home, banks want to ensure that a property has a clean bill of health and will not incur very high environmental remediation costs. An EPA audit of an Oregon boatyard led the agency to declare the yard a toxic waste site. Agents seized evidence of environmental crimes, including records and soil samples. EPA arrested, fined, and then sued the owner and the previous two owners of the boatyard to help cover the millions of taxpayer dollars spent removing toxins from the property. The owner pleaded guilty in 2004 in U.S. District Court to a felony violation of the Clean Water Act. Once dry, heavy metals are encapsulated in the sludge, it typically is classified as non-hazardous and can be disposed of with other marina trash. While some locations allow a certain grace period for environmental compliance, government authorities will often require a facility to hire a certified chemistry lab to periodically submit stormwater runoff test results. Many states require these tests every six months, and if toxic discharge target levels are elevated they often step up the testing intervals and mandate improvement. And the tests are not cheap. With better environmental tests and a commitment to wastewater standards, marinas can be seen as marine industry leaders in green practices, which can improve relations with compliance authorities. In addition to showing those in charge of wastewater standards that the marina takes environmental responsibility seriously, these green practices can help in dealing with regulators in many areas of the business. For example, marinas might have a better chance of obtaining approvals to dredge or renovate, especially if it involves environmental concerns, if the facility can show other ways in which it protects the environment, such as its commitment to green powerwash operations. Many media outlets feature companies that adopt new green and clean practices that positively impact the environment. If a marina grabs a vanguard position in environmental compliance, its initiatives will likely be publicized in local, state and possibly, the national press. Consumers are increasingly green conscious. Market research reveals that the environmental friendliness of products and services play key roles in purchase decisions. Does a non-compliant powerwash operation put a marina on thin ice? YES, especially if a nearby competitor has taken the plunge and invested the necessary capital to bring its powerwashing into compliance. A non-compliant marina that wants to compete with a compliant facility may do so by offering lower cost haul-out and powerwash services. What is the possibility then that the compliant owner will call to complain to regulatory officers and/or the media about illegal discharges? The compliant owner will be able to make a very good case that a non-compliant marina is unfairly undercutting its rates. How will compliance officers react to the complaint? How would the media respond? Do marinas want to risk the possible negative publicity? If marinas go clean and green, they can attain a positive return on their compliance investment. The approximate cost to have wastewater hauled off-site in North Carolina was more than $0.60 per gallon in the fall of 2010. Higher fuel costs will send this rate even higher. While the quantity of powerwash wastewater generated will vary greatly from marina to marina, a North Carolina Sea Grant study estimated that the average N.C. yard would generate approximately 11,000 gallons of wastewater annually. At $0.60 per gallon, average annual hauling fees would be about $6,000. Some yards charge customers a fee for each gallon of wastewater generated. Assuming that yards pass along the $0.60 per gallon disposal charge to their customers for disposing of the waste, a price benchmark estimate can be used to determine if revenue can be generated from treating and recycling boat wash wastewater. Supply costs for recycling systems vary, but most are measured in pennies for gallons. With a $0.02 supply cost per gallon, the annual average supply cost for a recycle system would be approximately $220. Some systems are so easy to use that labor costs to operate the system are not significantly greater than the costs to collect, pump and store wastewater for haul-off. Clean Marine Solutions, a North Carolina manufacturer of wastewater recycle systems, projects that a marina can generate almost $5,000 in profit annually, if it charges boaters the same $0.60 per gallon rate. A North Carolina boatyard owner recently estimated it cost about $3,500 to haul, paint, change zincs and cutless bearings, and launch a 45-foot sport fishing boat. A boat of this size will generate on average about 125 gallons of wastewater, making the environmental surcharge fee about $75 or 2 percent of the overall fee. This surcharge fee would effectively be equivalent to the 2 percent surcharge many states mandate for the disposal of tires and batteries. (The surcharge is typically based on the cost of the new item). The advantages of going clean and green now are great. For more information about solving powerwash compliance issues and wastewater treatment and recycle systems, contact us. The North Carolina Department of Environmental and Natural Resources (NCDENR) has granted “Deemed Permitted Status” to MarineMax-Wrightsville Beach. Thousands of savings will continue to be realized at MarineMax because the NCDENR waived the standard requirement that a licensed wastewater operator run the system. Many industries produce wastewater. The only facilities in the state of North Carolina that have been Deemed Permitted use Clean Marine Solutions’ VANISH systems. Click below to see the letter from the NCDENR conferring deemed permitted status to Marine Max. Clean Marine Solutions’ VANISH™ Wastewater Treatment & Recycling System has been selected as part of an effort to help boatyards and marinas on San Francisco Bay become compliant with the Federal Clean Water Act. San Francisco Baykeeper, an environmental non-profit, works to reverse the environmental degradation of the past and promote new strategies and policies to protect the water quality of the San Francisco Bay. Baykeeper provided funding to the Spaulding Wooden Boat Center in Sausalito to redesign its facility with cutting-edge pollution control measures. To this end, Spaulding purchased Clean Marine Solutions’ VANISH™ Wastewater Treatment & Recycling System. The Spaulding Center will use the VANISH to educate local boatyard and marina owners on how to reduce pollution of the Bay from boat repair and maintenance operations. They are designed to take the wear and tear of driving 18 – wheelers on and off the pad. Boats and Vehicles can drive in from any angle, with no sidewall set-up or take-down required. Specialty Boatworks, 262 Battleship Road, Bellville, NC is the first in the state to have its powerwashing operations brought onto environmental compliance and permitted by North Carolina Department of Natural and Environmental Resources Division of Water Quality. Specialty Boatworks purchased a VANISH 300™ Marina Wastewater Recycle System from Clean Marine Solutions in July, 2010. Specialty Boatworks requested and received “Deemed Permitted” status per NC State Administrative Code 15A NCAC 02T. “Deemed Permitted” status means that Specialty Boatworks did not have to go through the expensive full permitting process. Using Clean Marine Solutions’ VANISH 300 and Closed-Loop Recycle Environmental Compliance Plan it only cost Specialty the price of a stamp to receive a permit. An environmental consulting company estimated that Specialty saved over $8,000 by not having to go through the full recycle permitting process. Thousands of savings will continue to be realized at Specialty because compliance authorities waived the standard requirement that a licensed wastewater operator run the system. This is another key advantage of the VANISH 300 that sets it above the competition.